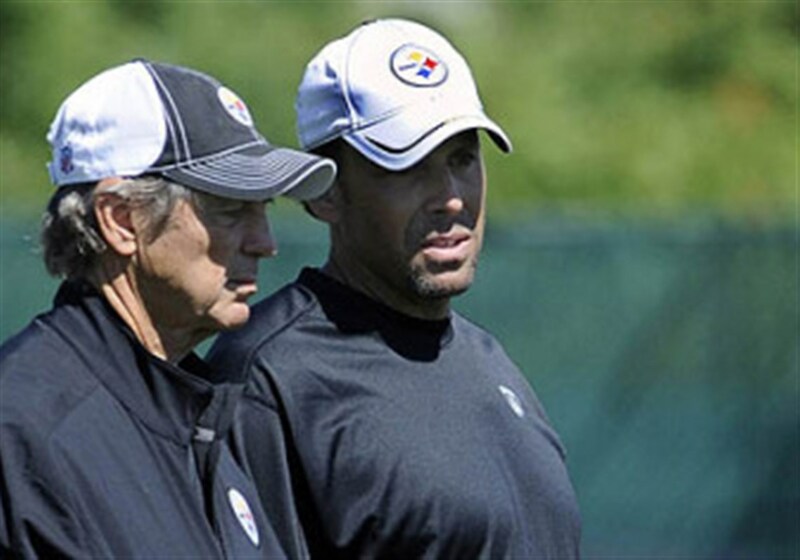 In a move that will draw wild applause from large sectors of Steelers Nation, saw the Steelers fire Todd Haley, who has served as offensive coordinator since 2012. 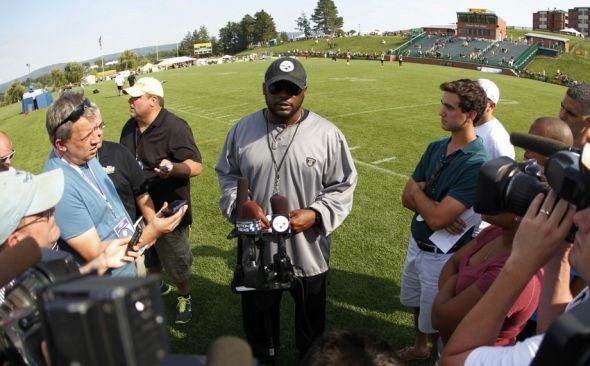 The NFL Network reported the news, and it has since been confirmed by the Tribune-Review and Pittsburgh Post Gazette. 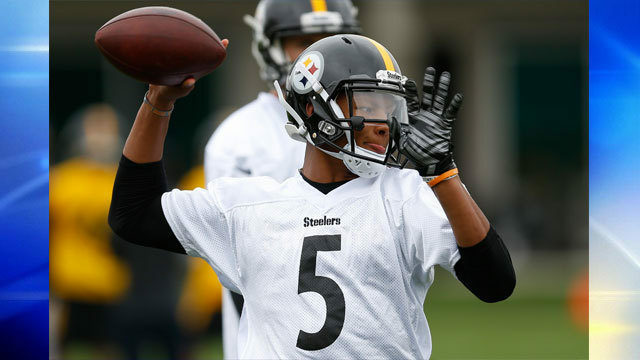 No word exists on a replacement, although Randy Fichtner, the Steelers quarterbacks coach is generally regarded as the front runner to replace Haley. Mike Munchak is a "serious" candidate to become head coach in Arizona, per NFL source. At the very least, it seems that the sound and fury generated by Todd Haley’s departure from Pittsburgh will mirror his time in the Steel City. 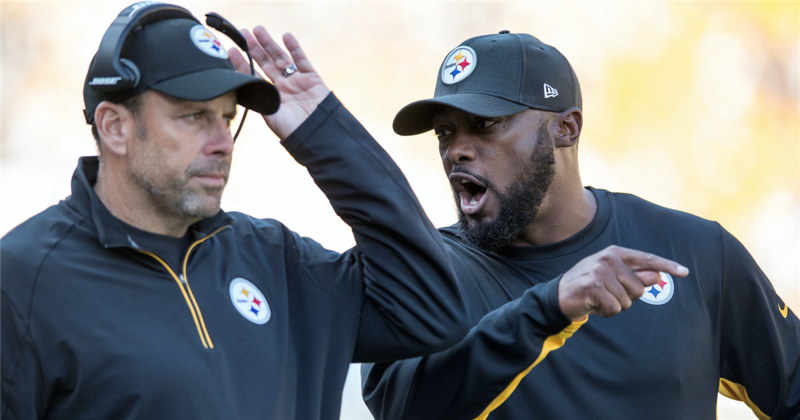 Todd Haley arrived in Pittsburgh after Art Rooney II pulled rank on Mike Tomlin, forcing him to fire Bruce Arians after the Steelers head coach had already announced Arians’ return. 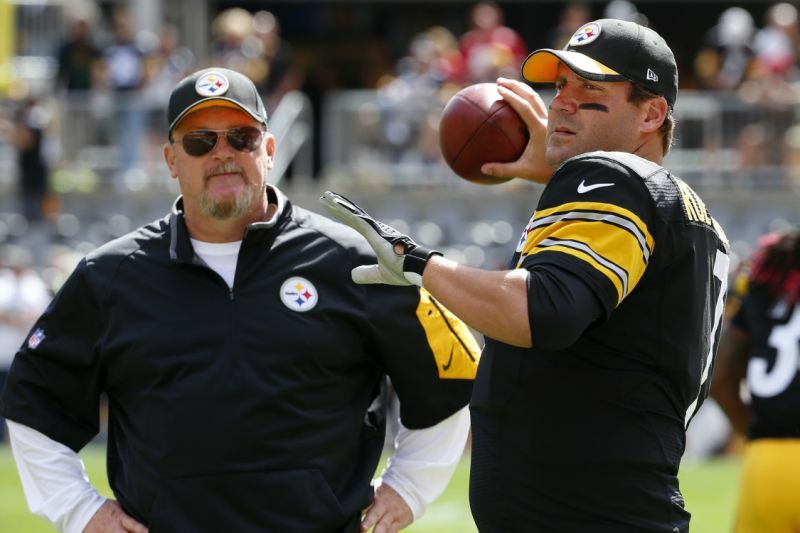 Although Arians had coached the Steelers to a title in Super Bowl XLIII, Arians refused to push Ben Roethlisberger to alter his game, and management was concerned for the signal caller’s health. The relationship between Ben Roethlisberger and Todd Haley did not start well, by a source no less authoritative than Bob Labriola, and even if only half of the reports are correct, always remained tense. 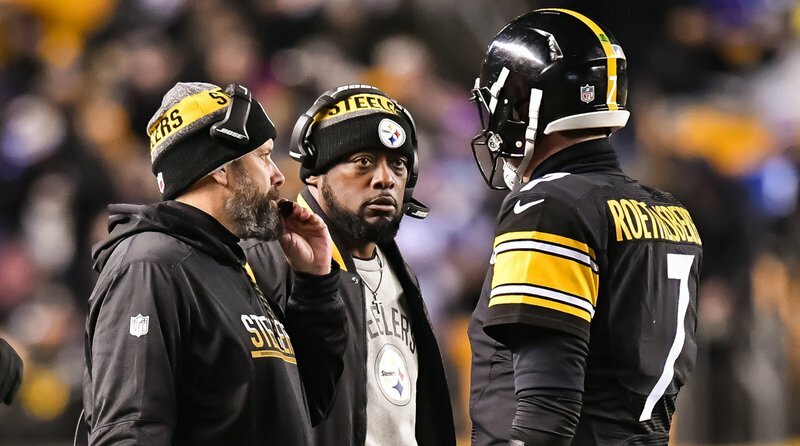 Indeed, if reports are correct, the Mike Tomlin moved quarterback’s coach Randy Fichtner to the sidelines in the middle of the season a Ben Roethlisberger’s request to provide a buffer between him and Haley, and Roethlisberger’s play improved accordingly. Yet, for all the tension, numbers reveal that Todd Haley succeeded in designing an offense which allowed Ben Roethlisberger to be himself, while not getting himself killed. The numbers above only go through the 2015 season, but the trends have largely sustained themselves since then. Nonetheless, fancy statistics do not win football games let alone championships. Stories of Ben and Haley not being on the same page, of Roethlisberger needlessly burning time outs because he didn’t understand or agree with the play call, were staples of the Haley era. It is indeed possible that this disconnect and on the field consequences and perhaps contributed to the confusion that doomed the final play from scrimmage against the Patriots. Undoubtedly, keeping Ben Roethlisberger happy is also fueling this move. A year ago Roethlisberger openly mused about retirement, and Ed Bouchette reported that this talk was likely prompted by an acrimonious exchange with Todd Haley following the AFC Championship loss to New England. The Pittsburgh Steelers end their bye week and commence the last half of their 2017 season today against the Indianapolis Colts. 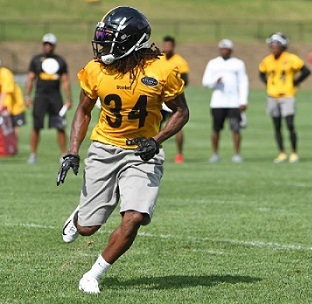 The Pittsburgh Steelers carry a 6-2 mark out of the season’s mid point, the same record they had in in 2008 and 2010, seasons which ended at Super Bowl XLIII and Super Bowl XLV respectively. And the news gets better. As Mike Frazer of Behind the Steel Curtain points out, Mike Tomlin second half of the season winning percentage is .663. Past performance doesn’t guarantee future returns, and Tomlin’s Steelers did see second half of the season implosions in 2009 and 2012. But Tomlin is only part of the equation. If there’s been one negative story line of 2017 it has been the sub-par play of Ben Roethlisberger. That brings the focus firmly onto number 7, opening the question: How has Ben Roethlisberger typically performed during the second half of the season? By any number of measures, Ben Roethlisberger’s play this year has been far below his best. Looking beyond the numbers, there’s no arguing that Roethlisberger has been helped by having an the best receiver in the NFL in the form of Antonio Brown and the best running back in form of Le’Veon Bell. And while Martavis Bryant has disappointed, JuJu Smith-Schuster has impressed. Forget the party line about Ben morphing into a steady “point guard” who’s having a stellar season “between the ears,” as he put it Wednesday. His numbers between the lines are pedestrian. He is missing more throws than usual. Forget about Sports Illustrated’s Peter King ranking Ben 10th on his list of midseason MVP candidates, too. You can only be an MVP candidate if you’re having a great season. Ben is not. Starkey goes on to argue that “I’m not sure I’d bet big on Ben returning to elite form, but there’s a decent chance…” justifying his faith in the fact that Ben Roethlisberger can still make all of the throws he needs to make. 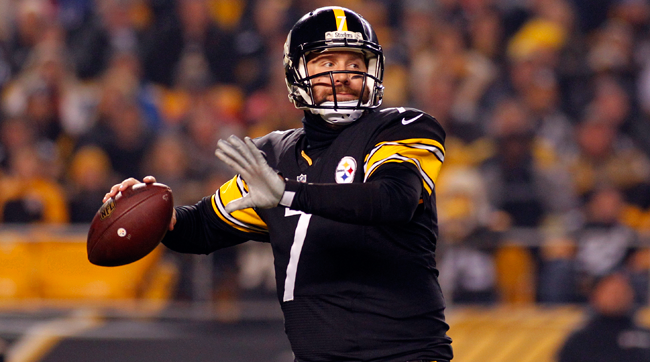 First, these numbers depict just how far below par Ben Roethlisberger has been this season. He key vitals are well below his career averages in ever category, save for sacks per drop backs and of course winning percentage. And, at first glance, the Roethlisberger first half of the season, second half of the season splits are a downer. Sure, his winning percentges is up and his sacks have historically dropped during the later 8 games of the season. But he’s thrown fewer touchdowns and his passer rating is down a full five points. That seems like very discouraging news. And it is, until you take a deeper look. 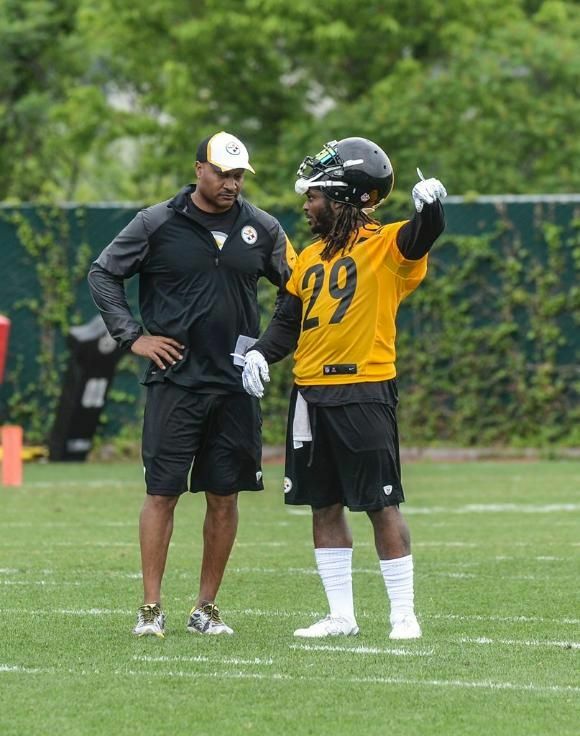 Like any player, Ben has seen ups and downs as his career has progress, has seen shifts in his supporting cast, and has had to work in 3 systems directed by 3 different offensive coordinators. 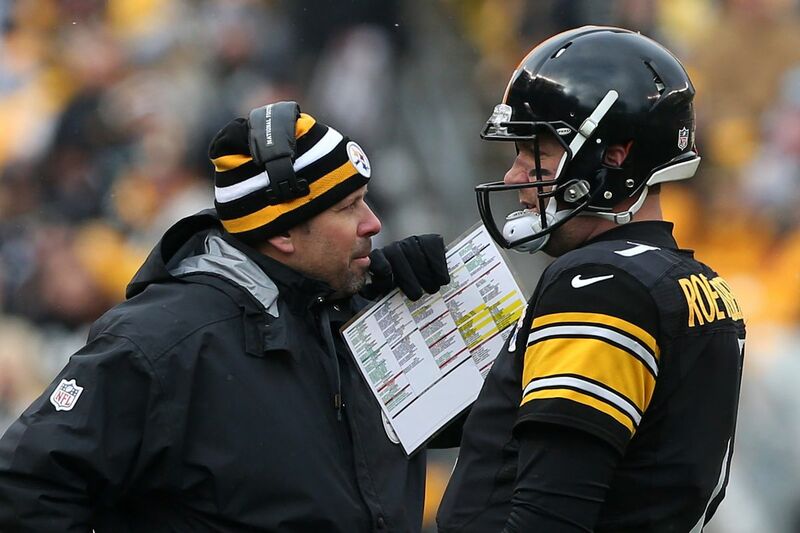 With Todd Haley, Ben Roethlisberger is playing better than ever in 2nd halves of seasons. First, its important to acknowledge that no matter whether Ken Whisenhunt, Bruce Arians or Todd Haley is calling the plays, the overall trend confirms itself, for the most part. But there are important differences, differences that fuel hope for a 2nd half of the season Roethlisberger resurgence. While playing under Ken Whisenhunt and with Plaxico Burress, Hines Ward, Antwaan Randle El, Santonio Holmes and young Heath Miller , Roethlisberger saw his biggest drop between halves of seasons. His completion percentage dropped almost 5 points, the threw 20% fewer touchdowns while throwing more interceptions. He also took more sacks, and his passer rating dropped a full 10 points and change. When you consider how young Rothlisberger was, the drop off under Ken Whisenhunt isn’t that surprising. When Bruce Arians took over, the overall trend continued, with some indicators improving while others deteriorated. Ben Roethlisberger’s sack percentage stabilized over the course of the season, but defenders still sacked Ben Roethlisberger on 9.4% of his drop backs. He threw fewer interceptions, fortunately, but his touchdown percentage dropped by a third. His winning percentage also dropped, but that is probably skewed a little bit by the 2009 Steelers notorious 5 game losing streak. Overall, Ben Roethlisberger’s passer rating dropped a little over 5 points from one half of the season to next under Bruce Arians, which was half of the drop off he saw under Ken Whisenhunt. The drop off in touchdowns is perhaps the most surprising, given that unlike Wisenhunt’s tenure, Roethlisberger only had Rashard Mendenhall, Isaac Redman and Jonathan Dwyer to lead his running game which by any measure marks a sharp drop off from Jerome Bettis and Willie Parker. So without the strong running game to lean on, one would figure Ben would be throwing for the end zone more under Arians. But perhaps he did and failed, and perhaps that’s why the winning percentage took a hit. Under Todd Haley, the differences between Ben Roethlsiberger’s first half of the season performance and his 2nd half encores get really interesting. First, with Todd Haley Ben Roethlisberger’s second half season winning percentage improves above his career average. Second, Haley is the only Steelers offensive coordinator to get Ben Roethlsiberger to throw more touchdowns in the second half of the season as opposed to the first. Haley has also managed to reduce Ben Roethlisberger’s sacks in the second half of the season relative to the first. And while Ben has thrown more interceptions in the second half of the season under Haley, his completion percentage and passer rating only drop by 2 points or less. It would be interesting to see who Ben Roethlisberger 1st half vs. 2nd half season splits compare with other elite quarterbacks, and particularly those such as Tom Brady who play in cold weather, as a modest drop off is almost a given when you account for the wind, cold and snow of the AFC North in November and December. The bottom line is, that while Ben Roethlisberger has seen his play decline through November and December throughout his career, he’s been better in the 2nd halves of season under Todd Haley than he was under Bruce Arians or Ken Wisenhunt. So take heart Steelers Nation, the numbers suggest that Ben Roethlisberger is capable of a 2nd half of the season rebound. The Steelers offensive line building strategy has seen a sea change during the Mike Tomlin era, perhaps like no other spot on the depth chart. During the first part of the Tomlin era, the Steelers used a “Plug and Patch” approach to building their offensive line. Whether it was because the Steelers drank their own “Weapons vs. Protection” Koolaid for real or because they won Super Bowl XLIII and went to another with a makeshift offensive line, or because Bruce Arians wasn’t interested in line building as Steel City Insider’s Jim Wexell reported in 2013, the Steelers ignored the offensive line in Mike Tomlin’s first several drafts. That changed as Ben Roethlisberger started taking more hits, and the question we look at here today is whether the Steelers should continue to focus on the offensive line in the 2017 NFL Draft. The Maurkice Pouncey anchors the Steelers offensive line having been voted to the Pro Bowl by his peers in each of his non-injury seasons. Marcus Gilbert holds down the right end of the Steelers offensive line, followed by David DeCastro, with Ramon Foster and Alejandro Villanueva playing to Pouency’s left. While it is fair to say that the Steelers offensive line got off to a slow start in early 2016, the unit gelled as the season progressed. Ben Roethlisberger took fewer sacks than he has in any season and Le’Veon Bell tured out single game performances in both the regular season and playoffs that neither Willie Parker, nor Franco Harris, nor Jerome Bettis could accomplish. That only happens of the Steelers offensive line is playing well. Behind their starting front five the Steelers have and B.J. Finney who can back up at guard and center. Next they have Chris Hubbard who can play both guard and offensive tackle. Ryan Harris retired, leaving 2016’s 4th round draft pick Jerald Hawkins and Brain Mihalik as the primary backups at offensive tackle. Both Chris Hubbard and BJ Finney saw action in during 2016, and both men played well, although Finney is stronger at guard than he is at center. Depth remains more of a concern at offensive tackle. Chris Hubbard started four games at tackle and also served as a third tight end as part of the Steelers “Big Boy Package.” In a perfect world Jerald Hawkins would give the Steelers 2 viable backups at offensive tackle, but Hawkins is an untested commodity. Fate has had a nasty way of reminding Mike Tomlin and Kevin Colbert that the old saying “You can never have too many good offensive lineman” during more than one season in recent memory. 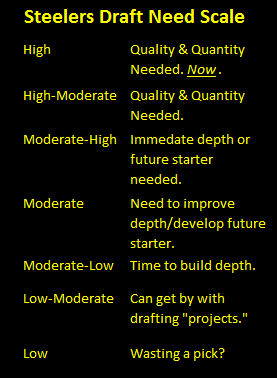 And that leads one to the temptation to rate offensive line a higher priority, but the Steelers essential need at offensive line is to build depth, and therefore Steelers 2017 draft need at must be considered Moderate/Low.